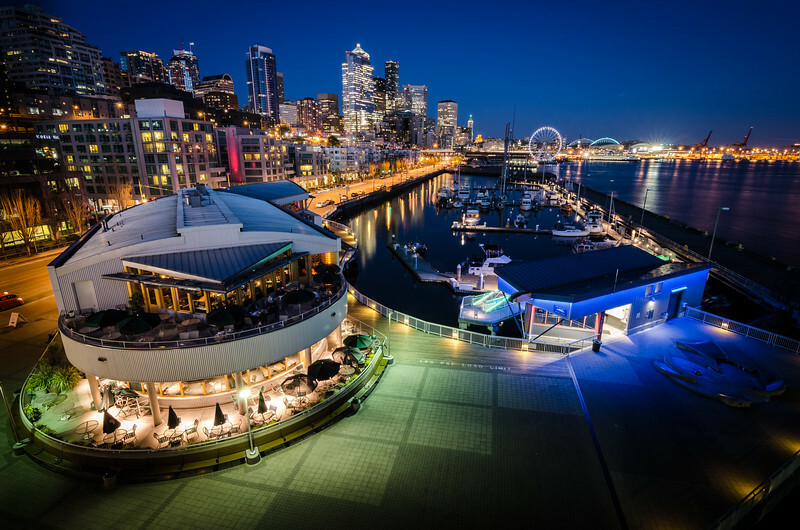 An amazing display of Seattle's city lights greet the eyes from the top of Pier 66. The blues in the sky and reflected in the water are blue hour remnants, but there are other colors that spice up this scene as well. The greens from mood lighting at the restaurant, a neon blue from the dock house, and a splash of magenta above the yellows of street lighting keep things interesting. 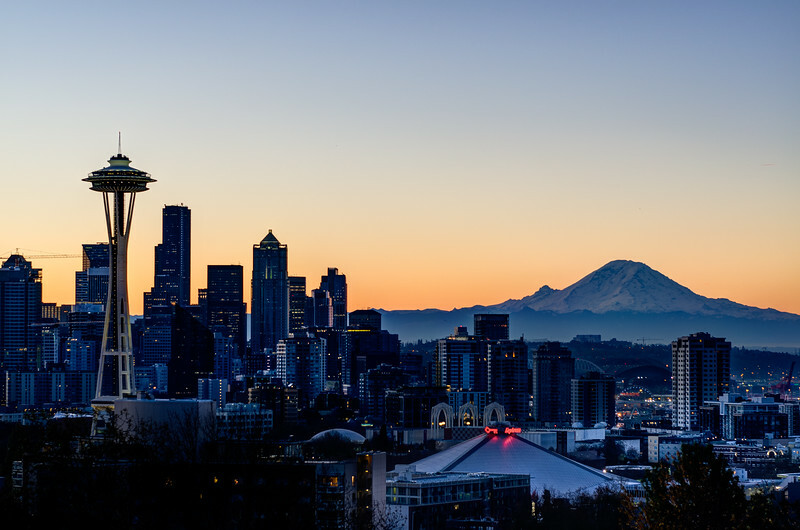 I found this interesting view of Seattle a few minutes before sunrise on an awfully chilly morning at Kerry Park. Space Needle, Mt. Rainier, Key Arena, sculpture, and a couple sipping coffee. 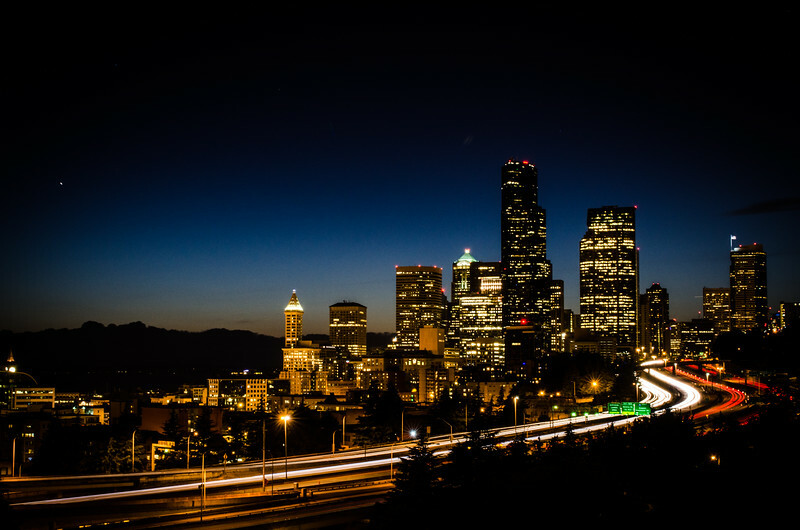 Twenty five minutes to sunrise over the sleeping city of Seattle. Mount Rainier is about to begin catching the first rays. 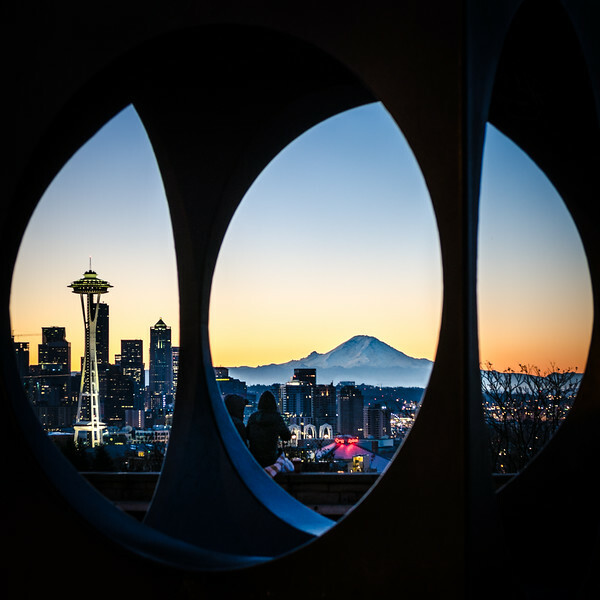 This is a shot from Kerry Park, a place that is often overflowing with photographers. On this 24 degree Farenheit morning it wasn't terribly full, and no one looked warm. 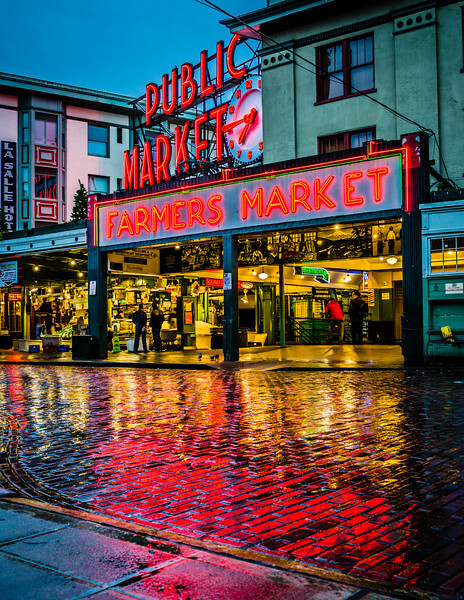 The heart of Seattle is lit up and the passersby stream through its arteries bringing it to life. Does it get better than this in Seattle? Hardly! When the clouds are gone, this place is a gem! This shot was taken in the summer right as the sun was setting in a nearly cloudless sky. The trees framing the scene are like a hallmark of this gorgeous, green place! They don't call this ghost alley for nothing. 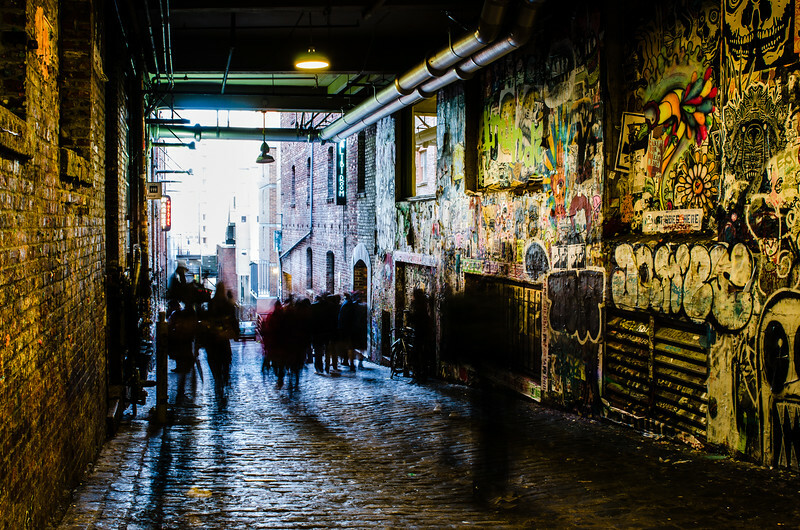 After taking a time exposure I saw all these ghostly shadows... :) This is also the gum alley. Folks seem to come from all over to chew gum and stick it to the wall. I'll show you the graffitti instead. Viewing of the Pioneer Buiding through an alley. 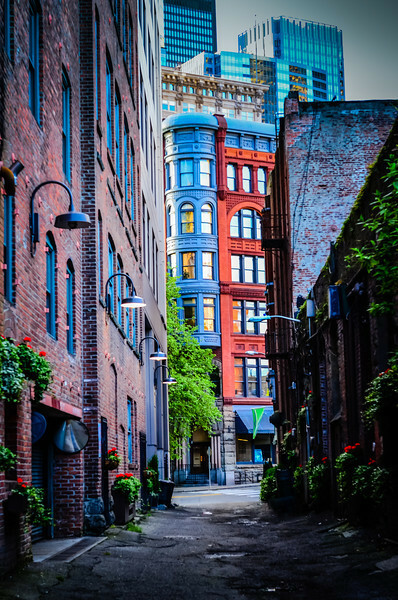 The Pioneer Building is a Richardsonian Romanesque stone, red brick, terra cotta and cast iron building in Seattle's Pioneer Square District. 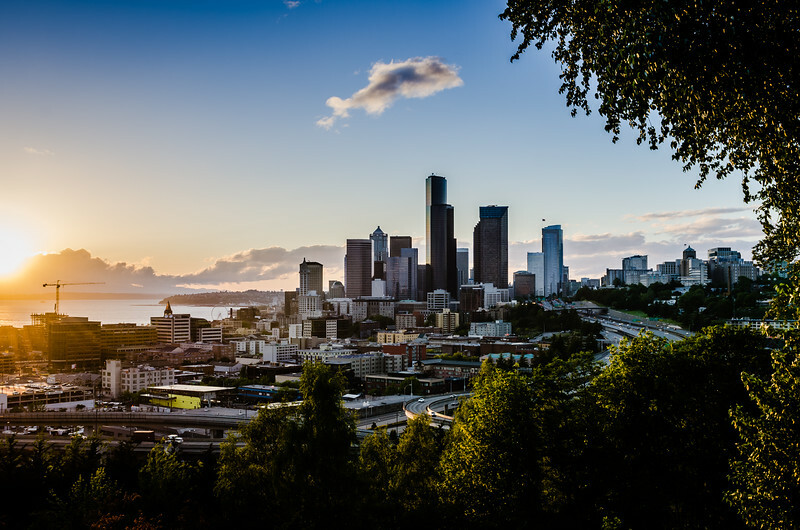 Completed in 1892, the Pioneer Building was designed by architect Elmer Fisher, who designed several of the historic district's new buildings following the Great Seattle Fire of 1889. Behind me is Occidental Square. This alley divides the square between 1st Ave S. and Occidental Ave. S.
Old granite walls and courtyard stones conspire together with a covering of fresh paint to emphasize the perspective lines that lead the viewer toward the upper entrance of this public building in Obidos, Portugal. 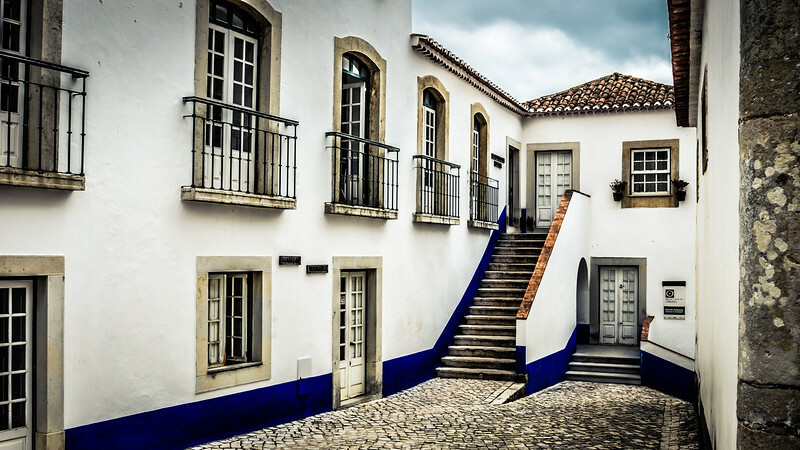 This is a travel category image from the Portugues town of Obidos, a historic town situated inside old castle walls.